The readathon’s here and I overslept! This is probably the second year in a row that I’ve overslept during the read-a-thon. Usually I’m up before it starts, which is 5:30 am over here in SoCal. 1. I’m reading from Southern California, also known as SoCal. 2. This time around I don’t have a stack of books. I’m just going to read whatever I want. My first two books will be XO Orpheus, a collection of short stories that retell world mythology, and The Whatnot by Stefan Bachmann. 3. The snack I’m looking forward to is homemade peanut butter cookies. I just have a craving for them. 4. You want to know something about myself? I’m the mother of three kids, lives close to the beach but only prefer to go during the winter. Strange I know. 5. 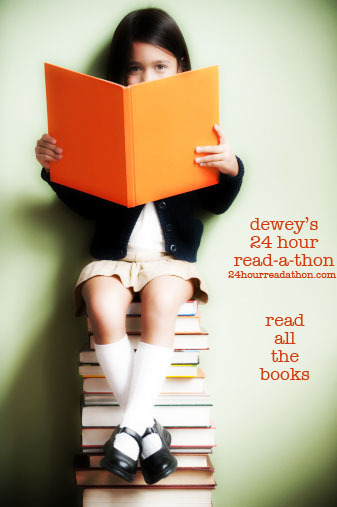 I’ve been participating in Dewey’s Read-a-thon since the very first one. The only thing different I’m doing today is . . . nothing. I’m doing the same things as always: tons of cheerleading, very little reading, and eating plenty of snacks. Plus, my kids are joining in too. I hope everyone who’s participating in the read-a-thon today have fun! Also, cheer your fellow readers on if you have time. Are you participating in today’s read-a-thon? Unfortunately, a few hours after the read-a-thon started, I wasn’t feeling that great. I ended spending the rest of the event in bed, sleeping with chills and a slight fever. Whatever it was, it’s gone so I’m happy. Books read: 0. Blogs cheered: around 30. Yay: you’re up! Let the fun begin! I hope oversleeping didn’t dampen the fun for you and you’re having a lovely time with the readathon! Hey there! Glad you made it! Cookies sound great. Yummm! Have a happy read-a-thon. Peanut butter cookies just sounds like heaven! Hope you read a lot today! Agh, if I had to be up at 5:30 AM, I’d have overslept, too. 😉 Those peanut butter cookies sound absolutely delicious! Can’t wait til Christmas when those ones with the Hershey Kisses stuck in them show up in every corner. I may end up going to the beach in the winter– I didn’t get to it in the summer, and I feel terrible for living so close and never actually getting there. Have fun and enjoy the homemade peanut butter cookies! I look forward to hearing your thoughts on XO Orpheus. 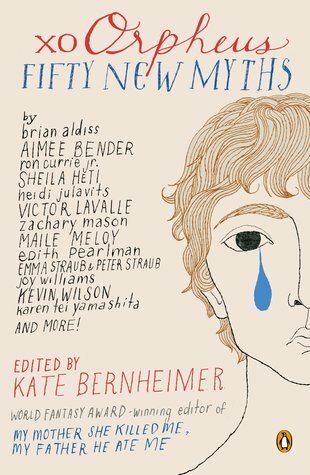 I only discovered today that there was a follow-up to My Mother She Killed Me My Father He Ate Me, but I’d willingly read as many of these books as Kate Bernheimer cares to edit. Here’s a quote to keep you going! I hope you had a good read-a-thon. I had a fun time! Hope you had a great time participating! So cool that your kids also got in on the read-a-thon! I miss this every year. This Readathon was a wash for me, too. Sorry you fell ill. Jealous of your peanut butter cookies!!! That’s too bad you got sick! I am glad you are over it!